Whether for medical or personal reasons, Dr. Stephen Hardy can provide safe, efficient breast implant removal at our office in Missoula, MT. As a board-certified plastic surgeon, Dr. Hardy can conduct precise removal as well as any associated procedures to create customized results you are satisfied with. At Northwest Plastic Surgery Associates, our entire team is dedicated to providing you with the highest level of care through advanced procedures, attentive staff, and personalized treatment. We understand the delicacy of these treatments and will always treat you with compassion. We will work with you to plan your implant removal to achieve your goals and protect your health. 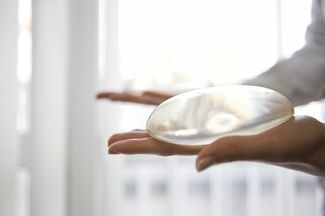 Is Breast Implant Removal Right for You? During your consultation, you can discuss your needs and cosmetic goals with the surgeon. Depending on your goals, Dr. Hardy may recommend that your removal be combined with other breast treatments for the best results. Breast implant removal is an outpatient procedure that typically lasts about one to two hours. However, if other procedures are combined such as a breast lift or new implants, the surgery will typically take longer. Prior to beginning your procedure, anesthesia will be administered to ensure your complete comfort. When possible, Dr. Hardy will carefully make an incision at the same location as your original incisions or in an inconspicuous area such as around the areola, near the armpit, or under the breast to minimize scarring. He will then remove the implants as well as any capsule tissue that may have formed, or, in the case of a rupture, surrounding silicone. We understand the delicacy of these treatments and will always treat you with compassion. We will work with you to plan your implant removal to achieve your goals and protect your health. Once everything has been removed, the doctor will skillfully reshape the natural breast for the most flattering results possible. To complete the procedure, he will close the treatment area with sutures. If you believe you are experiencing any of these in excess, you should bring it to our attention immediately. Patients can usually return to work within a week; however, strenuous physical activity should be avoided for approximately three weeks to one month following your procedure. Dr. Hardy can monitor your recovery and will advise you when you can return to regular activity levels. It will usually take several months for breasts to fully heal. We want what is best for our patients; as such, we will always recommend treatment with your best interest in mind. Reach out to us today if you are concerned for your health or are unhappy with your current implants by contacting us online or calling us at (406) 728-3811.